Beneficiaries who have traditional Medicaid can only utilize NET if their appointment is with an enrolled Arkansas Medicaid provider. No co-payments are required and there are no limits on the number of trips and no mileage cap. Beneficiaries enrolled in Arkansas Works may be transported to any health care provider within their network plan. The beneficiary must have a valid Medicaid number. There is a limit of eight legs/units per calendar year. The beneficiary may apply for an extension of transportation services when the eight legs/units have been exhausted. NET is provided through Division of Medical Services (DMS) contracts with six transportation brokers for the 11 regions in Arkansas. The brokers can also contract with qualified subcontractors in their areas and serve as a gatekeeper, processing transportation requests and monitoring complaints to ensure quality. DMS will conduct periodic on-site broker reviews for quality assurance. Medicaid Non-Emergency Transportation (NET) will undergo another change to the NET Brokers. Because MTM did not provide the level of services required in it contracts, DHS notified MTM on Thursday, Jan. 17, that is was cancelling MTM’s contracts for NET and day treatment transportation (DTT) for Medicaid beneficiaries in four regions of the state effective Jan. 31, 2019. DHS will transition to the second-lowest bidder for those services as allowed by Arkansas state procurement law. What are the beneficiaries’ responsibilities? If they can’t find their broker on the NET map, they can call the Medicaid NET Helpline toll-free at 1-888-987-1200, option 1. NET staff can help them find their broker and tell them how to contact the broker. Call the NET broker in their region at least 48 hours (two whole days) before the appointment. (Don’t count Saturday, Sunday or holidays.) For example, if the patient needs a ride to the doctor on Monday, they will need to call no later than Thursday. Have their Medicaid ID ready. 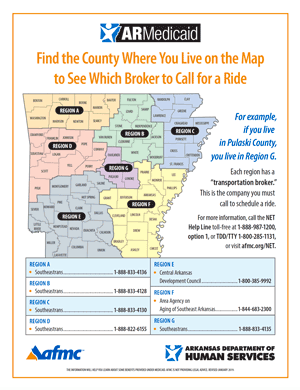 Tell the broker why they need a ride. Provide name, address and phone number of the health care provider. Provide the day and time of the appointment. If the patient must travel outside their region, they will need a referral from their PCP. The provider must send the referral to the NET broker. What are the brokers’ responsibilities? Accept reservations Monday through Friday, 8 a.m. to 5 p.m., except state holidays. Provide a toll-free phone number. Provide service for the hearing-impaired. Access the need for transportation services. Provide a pick-up time when the patient schedules an appointment. Provide a confirmation number to confirm the ride. Let the patient and provider know if they will be late. What is the Transportation Helpline? The toll-free Non-Emergency Transportation Helpline (1-888-987-1200, option 1) takes beneficiaries’ questions, comments, complaints and suggestions about the NET program. The NET Helpline will not arrange transportation; beneficiaries should call their local Medicaid transportation broker 48 hours before their appointment.